Overall, Sobers played 93 Tests for the West Indies, scoring 8032 runs at an average of 57.78, and taking 235 wicketsat an average of 34.03. He has the fourth highest batting average in Test cricket in the list of cricketers with more than 5,000 runs. In his 383 first-class matches, he scored over 28,000 runs and took over 1000 wickets, having spent time with South Australia and Nottinghamshire towards the end of his career. Sobers was knighted by Queen Elizabeth II in 1975 for his services to cricket. He became a dual Barbadian-Australian citizen through marriage in 1980. 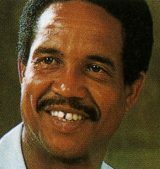 By an act of Parliament in 1998, Sobers was named as one of the ten National Heroes of Barbados. Joel Garner (born 16 December 1952), also known as “Big Joel” or “Big Bird”, is a former West Indian cricketer, and a member of the highly regarded late 1970s and early 1980s West Indies cricket teams. He was a 6 feet 8 inches (2.03 m) fast bowler capable of ripping through the heart of opposing batting line-ups. In conjunction with fellow fast bowlers Michael Holding, Andy Roberts, Colin Croft, and later Malcolm Marshall, Curtley Ambrose and Courtney Walsh, the West Indies reached unprecedented heights in the Test and one-day cricketarenas, not losing a Test series in 15 years. One of the tallest bowlers ever to play Test cricket, Garner appeared in 58 Tests between 1977 and 1987 and took 259 wickets at an average of barely above 20, making him statistically one of the most effective bowlers of all time. However, it was in limited overs cricket that Garner put his height to use with devastating effect. In 98 matches he took 146 wickets. He had the ability to unleash a devastating yorker, as well as the ability to generate more bounce. He is one of the two players (the other being Mitchell Starc) with more than 100 ODI wickets to average under 20, while his economy rate of just over 3 runs per over, and average of less than 20 runs per wicket are also the best ever for any bowler who took more than 100 wickets. His 5 for 39 in the 1979 Cricket World Cup final against England remains the best ever performance by a bowler in a final; it included a spell of 5 wickets for 4 runs, and he was on a hat-trick twice. Garner played for Barbados in the West Indies, for South Australia in the Sheffield Shield and alongside Viv Richardsand Ian Botham for Somerset in the English County Championship. He was at Somerset in the most successful time in the county’s history. In Barbados, his club team was YMPC. In the 2013 election he was the BCA candidate for vice-president of the West Indies Cricket Board, losing to Dave Cameron‘s running mate, Emmanuel Nanthan of Dominica, 8–4. As of 2016 he continues as Barbados Cricket Association president, spearheads West Indies’ drive in Masters Cricket, has served as a West Indies selector, and fulfils various other duties. Sir Anderson Montgomery Everton Roberts, KCN (born 29 January 1951) is a former Antiguan first-class cricketer. He was a fast bowler who played Test cricket for the West Indies, twice taking seven wickets in a Test innings. In England, he played first-class cricket for Hampshire County Cricket Club and Leicestershire County Cricket Club. Roberts formed part of the “quartet” of West Indian fast bowlers from the mid-Seventies to the early Eighties (the others being Michael Holding, Joel Garner and Colin Croft) that had such a devastating effect on opposition batsmen at both Test and One Day International level. He was also part of the West Indies team that won the first two Prudential World Cups in England in 1975 and 1979., although Roberts didn’t pick up a wicket in both finals. By his own reckoning, the best spell Roberts ever delivered was during the Headingley Test of the West Indies’ 1976 tour of England: “I only got three wickets, but in my mind there was a decision given against me. It was a leg-before decision against Peter Willey, where he played right back onto his stumps to a fuller delivery. 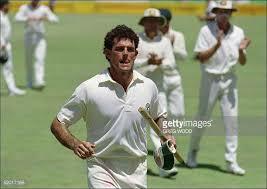 I would’ve bowled England out that afternoon if the umpire had given me the decision.” Despite an excellent record in Tests his international career was relatively short and ended in 1983. Imran Khan (former captain Pakistan national cricket team) once described a ball bowled to him by Andy Roberts as the fastest and most terrifying he had ever faced. Roberts was also the part of the West Indies team which ended up as runnersup in the 1983 ICC Cricket World Cup.In the low scoring final against India,he along with Joel Garner put on a 71 runstand for the last wicket.This still remains the highest 10th wicket partnership in Cricket World Cup history. 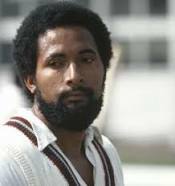 Andy Roberts’ contribution to West Indies cricket has continued since his retirement as a player. As an administrator overseeing the preparation of pitches, he helped prepare the pitches in Antigua on which Brian Lara twice broke the world record for highest Test scores. Roberts worked with Bangladesh’s fast bowlers in 2001 and again in 2005, and also helped coach India’s seam bowling all-rounder Irfan Pathan in 2006. Roberts joined the West Indies Cricket Board selection panel in July 2006. In 2008 Roberts was one of 12 former West Indies cricketers who made up the ‘Stanford Legends’ who promoted the Stanford 20/20. Roberts was appointed a Knight Commander of the Order of the Nation (KCN) by the Antiguan Barbudan government on 28 February 2014. Stuart Grant Law OAM (born 18 October 1968) is a former Australian-born cricketer, who played one Test and 54 One Day Internationals (ODIs) for Australia. Law also captained Queensland to five Sheffield Shield titles and two one day trophies, making him the most successful captain in Australian domestic cricket; he is also Queensland’s all-time leading run scorer in first-class cricket. He is also a cricket coach, and was head coach of the Bangladesh national cricket team in 2011–2012. He is the current head coach of the West Indies cricket team. After a couple of seasons with the Australian youth team, Law made his first-class debut for Queensland in the 1988/89 Sheffield Shield, scoring 179 in his second match. In 1990/91 he had a superb season, with a batting averageover 75 and scoring more than 1,200 runs. In 1996, Law made his English County Championship debut, with Essex, and such was his success in England that he averaged over 55 in all but one of his six seasons at the county, making his career-best score of 263 in 1999. However, disagreements within the club led him to leave for Lancashire for 2002. During his first season with Lancashire, Law was awarded his county cap. Apart from an enforced absence through injury for part of the 2004 season, Law continued to pile up the runs for his new team, scoring 1,820 in 2003 at an exceptional average of 91, and after hitting 1,277 championship runs in 2007, signed a new one-year deal with the club. 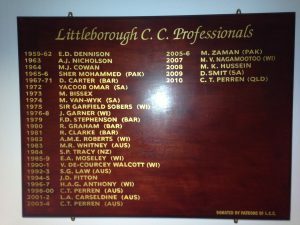 Following Mark Chilton‘s resignation as captain at the end of the 2007 season, Law was appointed Lancashire captain ahead of players such as Dominic Cork, Glen Chapple and Luke Sutton. He was released in October 2008 to be replaced by Glen Chapple as captain for the 2009 season, before signing a contract to play for Derbyshire in limited overs cricket in 2009. Law made his Australia debut in a One Day International in 1994/95, and captained Young Australia in England the following summer. In 1995/96 he played his first and only Test match in place of the injured Steve Waugh, making an unbeaten half-century, and subsequently being dropped upon Waugh’s recovery. As Law was not picked for Australia again, he is now in the unusual position of being a test cricketer without a batting average. It was a different story in one-day cricket, and he played more than fifty times for his country in that form of the game, including the 1996 World Cup. He was a middle-order batsman, and he occasionally contributed with some right-arm leg spin bowling. Whitney’s test debut came in unusual circumstances. Australia was touring England in 1981, and Whitney was in England playing Northern League Cricket for Fleetwood Cricket Club. Injuries to other bowlers in the Australian squad led to the Whitney playing the final two tests on the tour, only because he was the best available replacement in England at the time. He later played 10 more tests between 1987 and 1992, with his best performance being 11 wickets in a match against India in 1991–92. He also played 38 One Day Internationals, and was Australia’s most economical bowler in the 1992 World Cup.